Hey, folks! This is the day you’ve been waiting for! On April 16, Raw Meat Vancouver Roller Skating returns to Royal City Curling Club, 75 East 6th Avenue in New Westminster. We’ll be at RCCC from 10 AM to noon every Saturday all summer. Sessions are $12, and are always drop-in. Just come on by! You’ll love skating at RCCC. There’s a full size roller derby track, plus plenty of extra space. The floor is polished concrete, and it’s a joy to skate on. As always, skaters of all levels are welcome, from total beginners to experts looking for more time on eight wheels. 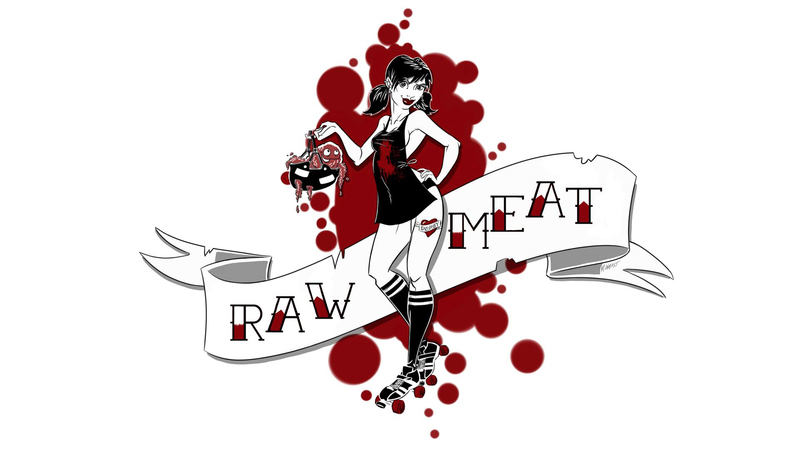 At Raw Meat, you’ll learn all the roller skating skills that you’ll need to try out for a roller derby league in the fall. Skills include stops, falls, backwards skating, transitions, agility, jumps, weaving, skating with others and more. Plus, we’ll through in some fun and games as well. If you aren’t interested in roller derby, never fear, all of these skills will serve you well skating the seawall, too. All skaters must have roller skates, helmet, mouth guard, and wrist, elbow and knee pads. If you have white tape on your pads from skating at Thunderbird Community Centre, remove it before you get to RCCC, and you’ll have a lot more fun. ← April 9: Last session at Thunderbird, April 16: First session at RCCC!